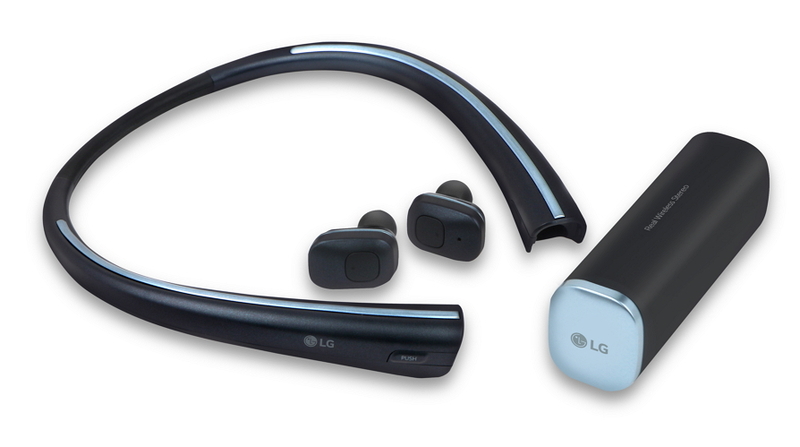 LG Electronics (LG), a leader in Bluetooth headset technology, will unveil a number of new wireless, wearable audio products at CES 2017. The lineup will be led by TONE Studio wearable speakers capable of delivering amazing 3D surround sound and TONE Free earphones with wireless earbuds that charge when docked in the companion neckband. The LG TONE Studio (model HBS-W120) personal wearable speaker features four speakers - two full range on the top and two vibrating on the bottom - that give a personal surround sound experience when watching a movie, playing a video game or simply streaming music. Its sound is designed in collaboration with surround sound experts at DTS to bring a realistic theater-like sound for a cinematic experience wherever you may be. The TONE Studio features a Hi-Fi DAC (Digital to Analog Converter) that enhances sound quality by recreating audio content as accurately as possible. What’s more is that with Dual Play, you can connect two LG TONE Studio wearable speakers and share the sound from a movie, playlist or more.